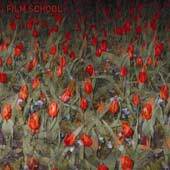 A swathe of red, impressionist tulips adorn the sleeve-art for this eponymous album by San Francisco's Film School. I notice that many of the flowers are woefully out of focus, blurred or possibly double-exposed. If I stare at the cover, I begin to see shapes and patterns behind the image just like those optical puzzles that were the fashion a few years ago. I get the impression then, if I can make my eyes go soft and blurry, I can bring the other something into focus and see the truth of this work. Sadly, my eyes have never learned the trick of this. Mercifully, the ears function rather better because the same aural effect is apparent. What I hear is competent and pretty. Film School would appear to be enthralled with angular alt-rock. Add FX pedals and a rhythmic debt to early 80s, indie-funksters, Gang of Four and all the signposts appear to be in place. Yet I'm given the impression of something else beneath the surface. Signposts then… to where? Opener On and On illustrates Film School rather well. Emerging deceptively from swirling noise with bold, majestic guitar reminiscent of The Edge, it quickly proves seductive. The driving, rhythmic verses of Pitfalls might be candidate for best single Bloc Party wish they'd written. Sick of the shame is a Longwave lullaby, while Breet has something of an early New Order within its reverb. The best surprise? The climactic Like you know. It is a touching, oceanic ballad, preferring tender introspection to arty indifference. Somehow it's both solemn and optimistic, giving the album something that many rival efforts lack:a soul. Vocals will certainly divide audiences. In today's post-Buckley era, it seems an Angelic croon can be found almost anywhere. Almost….but not here! Singer/lyricist Krayg Burton is revealed as Californian slacker cousin to England's Robert Smith of The Cure, (without the cat noises) gasping, croaking and choking a path through his material. This atonal delivery reaches its zenith (or should that be nadir?) on P.S., where Burton recalls Stephen Malkmus at his arch, pitiful best. With time, this limited vocal style will become restrictive and Film School might be wise to consider the development of Burton the persona to enrich the live experience. Burton the lyricist too can only improve, adding an extra dimension to their recordings. An impression, then, of tantalizing promise. Like Doves' Lost souls, Film School is a triumph of style over substance. Where some bands overreach, this work is understated, but not un-ambitious. Rather, the opposite. The listener is given the impression a great deal more is to follow. If they can develop their writing and arrangement sufficiently enough to break free from any slow-core or drone accusations, they will hold the map to the skies in their hands. The wonderful, 'effect and loop' coda that is Garrison might show the way? Punctuating their work this way by blending two powerful genres, New Wave and Post Rock, Film School may well emerge from both packs with something less ephemeral but far more defining.